The Bosu weight plate front shoulder raise is an intermediate strength exercise. This is a challenging exercise that targets the shoulders and core and requires balance and core stability in order to be done properly. The BOSU balance trainer stands for "Both Sides Utilized" and is most often used for balance training, various athletic drills and aerobic activities. Start on top of the Bosu with your feet slightly narrower than shoulder width, a soft bend in your knees and most of your body weight on your heels. Hold the weight plate in both hands just off of your thighs. Raise the weight plate up to the same height as your forehead making sure that you keep your core engaged and your knees bent. 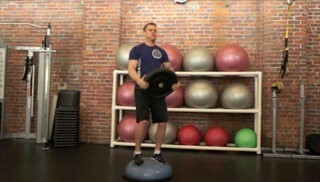 Lower the weight plate back down to the starting position maintaining proper form throughout the entire range of motion.